One of seven Native American tribes that share the Apachean, or Southern Athabascan, language. The Jicarilla Apache originated in Canada's Mackenzie Basin. Archaeological and ethnological evidence suggest that by the year 1400 the original Apache group had migrated south and began to separate into a few different tribes. By the time the Spanish arrived in the Americas, the Jicarilla people were settled in a large territory stretching over the Chama Valley of present-day New Mexico and eastward into Oklahoma. The Jicarilla Apache, through centuries of struggles over land against Spanish and then U.S. forces, have lost most of their territory. Today their reservation, which lies close to the eastern part of the Navajo Nation Reservation, occupies a small portion of northcentral New Mexico. In ongoing efforts to address the problems associated with loss of land, resources, and cultural heritage, such as poverty and crime, the Jicarilla Reservation government invests in retail and tourist enterprises, emphasizing active conservation of traditional arts, beliefs, and rituals. 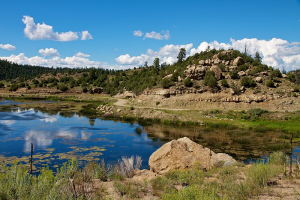 "Dulce Lake, Jicarilla Apache Nation, New Mexico, August 6, 2010" by Christopher Nicol. Indian Series. Norman: University of Oklahoma Press. 1942 Social Organization of the Western Apache. Chicago: The University of Chicago Press. Publications in Anthropology. Albuquerque: University of New Mexico. 1992 The Jicarilla Apache Tribe: A History. Rev. ed. Lincoln: University of Nebraska Press. 2006 The Jicarilla Apache: A Portrait. Albuquerque: University of New Mexico Press.